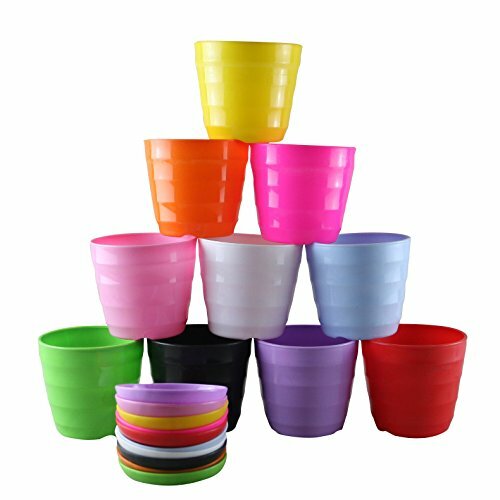 Features: 10 pcs resin flower pots It is very light weight, cute pots, the pot bottom has small holes to keep soil drained and ventilated Material: resin Note: The color may a slightly different from pictures because of the lighting and monitors. Please notice the pot size before you decide to purchase, it is just suitable for tiny plants. Self Watering Mini 3.5" Planter Pots (3 Pack IVORY) Grow a Indoor Window Sill Garden. Perfect for Potting Smaller House Plants, Herbs, African Violets, Succulents, Flowers or Start Seedlings.